Atm. I have Aquaero 6 XT with 7x PA3 connected via aquabus and as we all know, Aquaero is limited to 4 Curve Control channels. I am aware that I can still add Quadro to my current setup, but will adding Quadro also add additional curve channel. It appears at least one curve controller comes with the QUADRO. From the text I am not sure if each fan port can be assigned it's own controller. I have never used a PA3, so I do not know how that works. But why would it matter if you have the curve controller under the aquaero tab or the QUADRO tab? 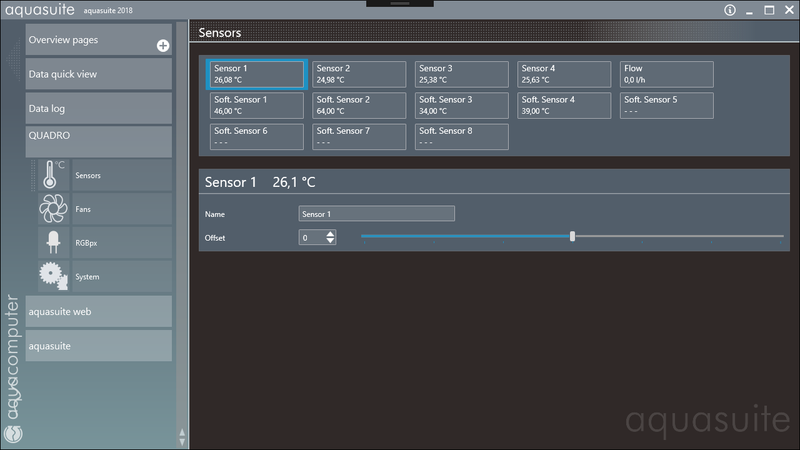 You can pull in 8 Software sensors from the aquasuite Windows services to control the curve(s). Doesn't seem to add an extra curve controller to the AQ6. You are still limited to 4. Another thing is that once you connect it through aquabus to the AQ6, you lose control over the fan outputs through the Quadro and can only control them through AQ6. I have it on both USB and aquabus and fan control is impossible through Quadro tab. It seems that only start boost setting affects it (seems to be a bug), but otherwise you can use the curves in Quadro AQ6 while it's connected through aquabus. I will test it but don't know if I can today. Will report back. No problem, thanks anyways. I was thinking on getting quadro to use for my front intake fans with curve control rather than 2 point control as I have used all 4 curves on my rads, but I'm wondering how all that looks being connected via aquabus only. So, I disconnected the USB cable and the Quadro disappeared from aquasuite. 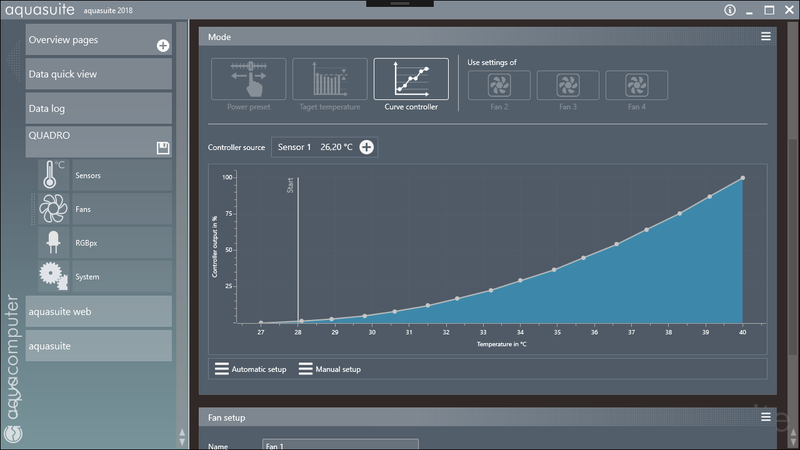 In this case only the fan outputs can be controlled through AQ6 only. Ooo I see, so even thou you disconnected quadro from USB it seem that it has its own tab. That image is quadro connected only via aquabus? Like I mentioned yesterday, once you disconnect the USB link from the Quadro, you lose it's tab in Aquasuite and have to control the fan outputs through AQ6 as usual (no RGBpx or anything except fans through AQ6). The picture above was taken with the USB and aquabus links bith connected.